I have a confession: I don’t think I’ve ever even tasted ribbon candy. At the same time, it is undeniably Christmas-y, as evidenced by how it suddenly pops up in stores when December rolls around, and its stripes and rounded folds make it an irresistible decoration. 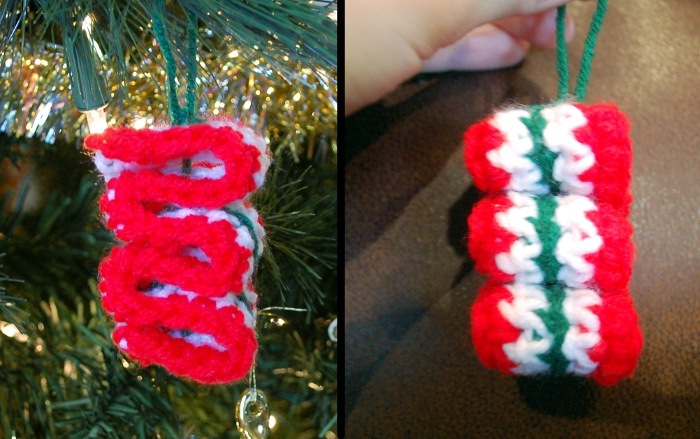 Almost as soon as the idea of making one into an ornament occurred to me, I’d started on it, and you can have some ribbon candy on your tree, too, with just a few minutes of crocheting. Worsted weight yarn scraps; just over 5 yards of two colors (C1 and C2), small amount of the third (C3). Ornament shown in Red Heart Super Saver. Gauge: Gauge is not significant in this design. 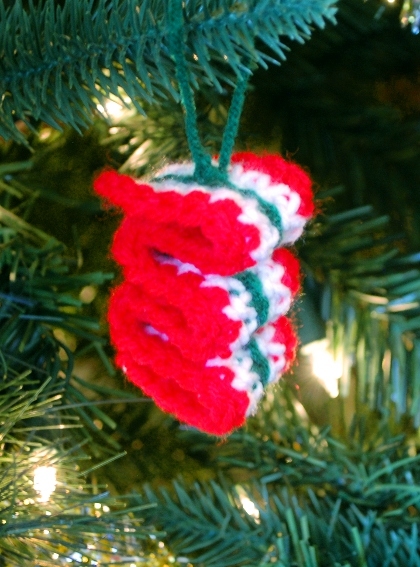 This ornament could easily be translated into thinner or thicker yarn, but worsted weight and hook indicated should yield an ornament of approximately the same size as the one shown. Row 1: With C1, ch 36. Sk 1 st, sc in each ch across. Finish off C1, begin C2. Turn. Row 2: Ch 1; sc in each sc across. Finish off C2, begin C3. Row 3: Sl st in each st across. Finish off C3 (leaving a tail of yarn at least 8″ long for assembly), begin C2. Row 4: Ch 1 and, working in front loop only, sc in each st across. Finish off C2, begin C1. Row 5: Ch 1; sc in each sc across. Finish off. Finishing: Weave in all ends except long tail of C3. Thread long tail of yarn onto yarn needle. 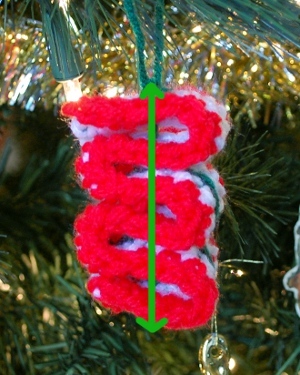 Fold strip as shown or to desired appearance; weave tail through a couple of stitches (in from the edge) until bottom center of ornament is reached. 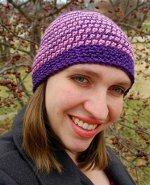 Sew up through layers to anchor in place – be sure not to pull layers completely tight or it will not have the characteristic ribbon curves. Tie remaining yarn into hanging loop and trim ends. Enjoy! Your ribbon candy ornament is cute. I made it up and added a 6 row of sl st. I thought it balanced it out more. I hope you like my idea.